On 21 August 2007 the then ailing and dementia afflicted illegal President Josefa Iloilo signed the illegal Attorney-General Aiyaz Sayed Khaiyum’s Water Authority of Fiji Promulgation 2007. A New Zealand citizen and former milk technology assistant turned bogus economist, John Prasad was appointed the new chairman of the newly-established Water Authority of Fiji. Two years later, in February 2009, Khaiyum announced that besides his buddy Prasad as chairman, the other board members were to include Sunil De Silva, Illisapeci Bole, Ram Shandil, Saipora Mataikabara and Lasantha Thennakoon. The Water Authority was to operate from the premises of the Ministry of Public Enterprises, headed by Khaiyum. Recently, Prasad was appointed as acting CEO of Fiji Sugar Corporation at its Lautoka headquarters after being kicked out of the Finance Ministry for failing to provide his CV to the Public Service Commission. He has been accused of falsifying his academic and employment achievements. A Coufourpointfive investigation reveals that Prasad worked for LPS Management Limited (LPS), a swimming pool operator in New Zealand, otherwise he was unemployed. He worked with one Mark Dawson, previously a car salesman in Hamilton, NZ, now calling himself a water treatment specialist. Both, Prasad and Dawson are accused of owing a lot of money to Tennix Robert Stone water contractors. At one point the two fell out, but the 2006 coup brought them together when Prasad’s buddy Khaiyum set up the new Water Authority of Fiji. After Suva Grammar School, Prasad joined Rewa Dairy Company as a milk technology assistant. He was working under one Suruj Bail, production manager. When Bali migrated to Australia, Prasad migrated to New Zealand after his mother inherited some flats in Herne Bay, Hamilton. Prasad recently married Robert Khan’s daughter, sister of the dictator’s propaganda NZ Radio Tarana owner. Coupfourpointfive has obtained documents which reveal that Prasad gave Dawson and one David Cox the contract to review the water treatment works in Suva. The Report is titled “Review of capital Investment program and Waila Water Treatment Works in Suva/Nausori”. According to the Report, the Consultants identified a number of key strategic issues related to the water supply situation that will have a long term effect on water supply in the region and the organisation’s ability to deliver improved services in future. In addition, the Consultants have received and reviewed a number of documents related to the Department itself or the technical aspects of the water supply. In particular, the focus has been to ensure that the time spent by visiting specialists has been maximised by the acquisition of valuable information. Information was gathered in the following ways: site visits such as visits to water treatment works and depots; meetings with relevant agency staff; formal and informal requests for information and document review; presentations; and informal discussions with Planning and Operational staff. The information collected was reviewed and analysed. Name: David Cox, Designation: Team Leader, Mobilised: 20 April 2008; Mark Dawson, Water Treatment Specialist, 20 April 2008. According to the Report, the above staff was actively engaged in meetings and site visits for the duration of their stay from the 21st to 25 August 2008. Now, it has emerged that the Report was already prepared by Prasad’s cronies in Fiji, and the four-day visit of the ‘Consultant Team’ was a smokescreen. The NRW Specialists Pty Ltd, the reviewers, was from where they formed the Water Authority of Fiji. Dawson reportedly boasted that he got a $13.5m contract to do the water works in Fiji from Prasad, with the former milkman technologist pocketing thousands in kickbacks, held in his New Zealand bank account. Coupfourpointfive sources say both Prasad and Dawson have no experience in water management, and that LPS is $100 Company, run by Prasad (describing himself as Contract Project Manage) and Dawson. Along with Khaiyum, the two are also holding accounts in Malaysia and the Philippines. The sweet talking conman Prasad is now in temporary charge of sugar in Fiji. And his wife travels first-class, courtesy of the FSC which has no money but pays business class fares for spouses. 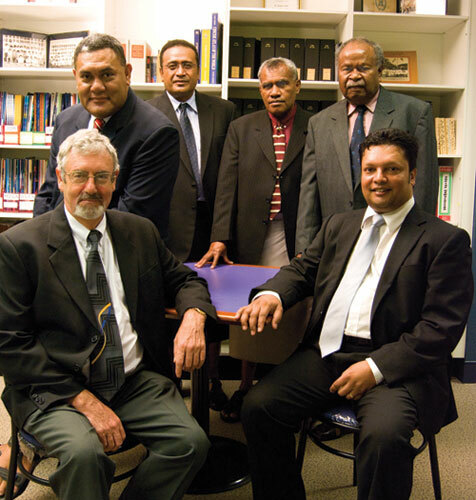 Prasad (pictured above with the Fiji Development Bank board) must be hoping that there will be no sweet revenge for his continued perpetuation of fraud on the people of Fiji. If so, he is mistaken. Sooner, rather than later, he will ‘drown’ in his own bogus money milking machine. 1) Is John Pasad's mother first cousin to Joe Singh? 2) Were they living next door to late Peter Pritipal Singh's house at the corner of Tanoa Street? 3) Was Prasad's father, the late Saten Prasad, a close drinking buddy of Mahendra Chaudhry when he was a live? 4) Is his economist experience coming from merely managing his mother's multiple properties, hence no real experience at all? There is a company that owns about two water tanker trucks based around Whitford Manukau City, Auck, that carts water around when water supply disrupted at various addresses. Wonder whether this same Dawson in above has any connection.....all they do is water cartage to consumers needing temporary supply.